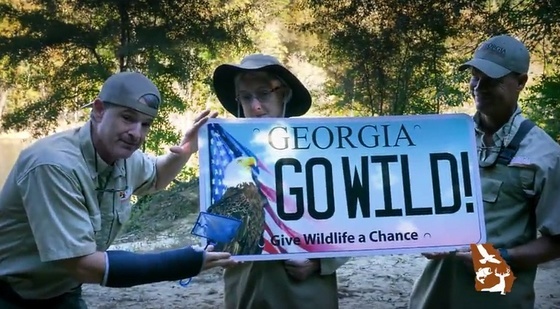 How can you help conserve Georgia’s native wildlife? Why don't we let DNR's rapping ichthyologist, Brett Albanese, deliver that word? More details, minus Dr. Bre, at www.georgiawildlife.com/licenseplates. Red-cockaded woodpeckers have returned to River Creek. 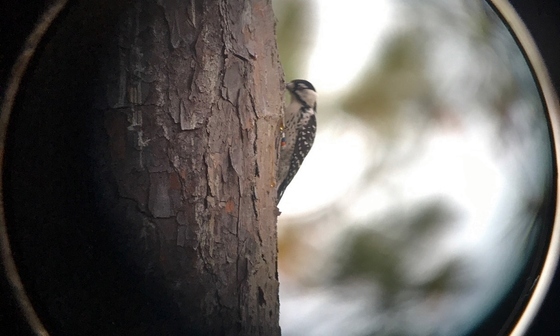 DNR’s Nongame Conservation Section teamed with partner organizations Oct. 19-20 to capture and move eight of these small, endangered woodpeckers from Apalachicola National Forest to River Creek, the Rolf and Alexandra Kauka Wildlife Management Area. The species has not been a resident at the southwest Georgia WMA for some 30 years. The four males and four females were released in pairs. “The idea is they stick around and establish breeding pairs, and throughout time build the population up,” DNR wildlife biologist Joe Burnam said. If so, the property bought in 2005 in part to restore these woodpeckers will be only DNR’s third WMA with family groups of them. Red-cockaded woodpecker before the move from Apalachicola. Joe Burnam puts a newcomer in a River Creek cavity at night. Two birds fly free at dawn as screens are removed from cavities. Some red-cockaded woodpeckers apparently are prone to wander. 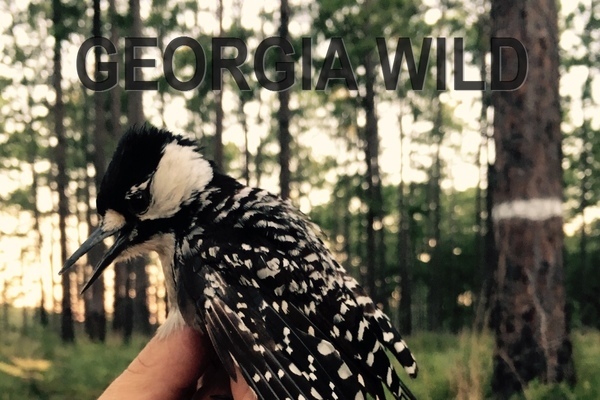 Biologists discovered this summer that a female woodpecker that raised young the past five years at Joseph W. Jones Ecological Research Center at Ichauway was banded in 2011 on a Red Hills Region plantation near Thomasville. The distance between the Jones Center, near Newton, and Red Hills is about 6o miles as the crow – or woodpecker – flies. This red-cockaded woodpecker is the second on record to move from the Red Hills to the Jones Center. Georgia homeowners face many tasks they want to finish before winter arrives, from splitting wood to planting wildflower seeds, winterizing faucets and, well, you name it. But I would like you to consider adding another chore: putting up a nest box or two in your yard. You’ve probably usually done this in late winter or early spring. However, there is a very good reason why early November is an ideal time to put up a nesting box. You will be providing bluebirds or other cavity-nesting birds with a safe, warm roosting site throughout the rest of the fall and winter. 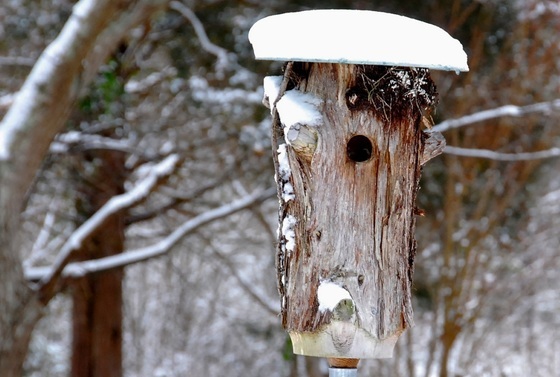 Read the rest of Terry’s column for more on adding nest boxes now. 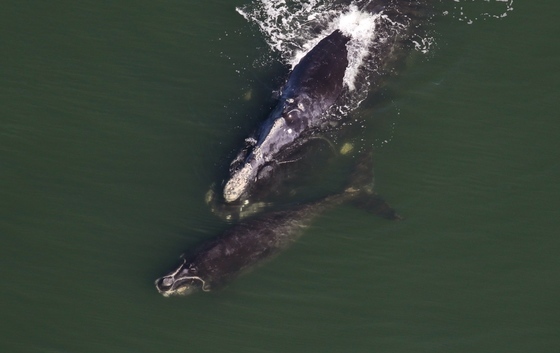 Survey flights for North Atlantic right whales start next month off Georgia and Florida as the bus-sized mammals return to their only known calving grounds. Yet, while hopes are high, 2017 has been a tough year for one of the world’s most imperiled whales. Sixteen right whales – about 3 percent of the population – were found dead off the coast of Canada and New England, many from human-related causes such as ship strikes and entanglement in commercial fishing gear. DNR and other biologists in the Southeast also are preparing to possibly deal with entangled whales: Five were seen trailing fishing rope this summer in Canada. During the last calving season, only three mother/calf pairs and an adult male were seen ("Record low," April 26). That’s the fewest right whales since surveys began in the 1980s. The count also extended a below-average trend in calving that dates to 2012. The lone bright spot was that although that adult male, nicknamed Ruffian, was entangled in fishing gear, crews managed to free it ("Ruffian returns north," Feb. 24). The rope and trap/pot removed were confirmed as Canadian snow crab gear, a type also involved in some other lethal and nonlethal entanglements this year. Georgia’s barrier islands and associated coastal habitats were collectively designated a Landscape of Hemispheric Importance by the Western Hemispheric Shorebird Reserve Network this week. 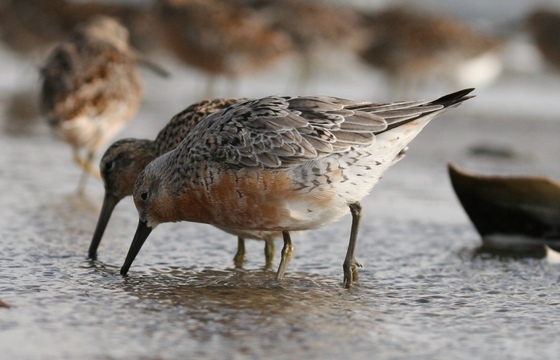 The recognition is supported by the islands providing habitat for more than 30 percent of federally threatened red knots and the Great Lakes breeding population of endangered piping plovers, among other shorebirds. It increases the potential of grant-related funding for shorebird projects and provides a springboard for outreach and education. The barrier islands are the network’s 100th site, its third landscape and its first landscape to include an existing site -- the Altamaha River delta, named a site of regional importance in 1999. A Cherokee County teacher’s proposal to create a pollinator garden at her school has earned a $1,000 grant from DNR’s Nongame Conservation Section. Karen Garland, K-5 Discovery Science Lab teacher at Clark Creek Elementary STEM Academy in Acworth, received the 2017 Conservation Teacher of the Year grant, funded by nongame friends group The Environmental Resources Network (TERN) and given to a third- through fifth-grade educator in Georgia who demonstrates exceptional energy and innovation in teaching life sciences. Conservation partners celebrated the final land acquisition at Sansavilla Wildlife Management Area Oct. 16. The 19,500-acre WMA in Wayne and Glynn counties has gopher tortoises and at least 16 other high-priority species, 2,600 acres of key longleaf ecosystem restoration areas, and more than 12 miles of Altamaha River frontage. Watch this U.S. Marines Combat Camera video about the event. 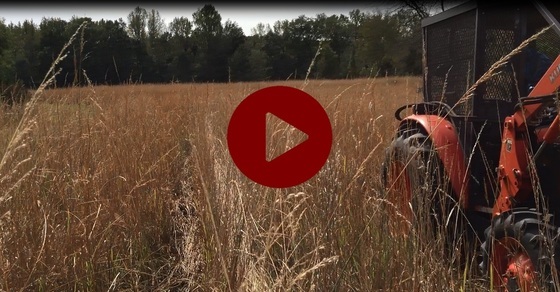 Restored grasslands at Panola Mountain State Park yielded a record harvest of about 700 pounds of indiangrass seed. Senior wildlife biologist Nathan Klaus, who harvested the some 200 acres over two days, said the Georgia genotype seed will be used to restore grasslands at Sweetwater Creek State Park, a project involving the Nongame Conservation Section and DNR's State Parks and Historic Sites Division. On heels of the Georgia Plant Conservation Alliance’s annual symposium last month, a report on the role of southeastern national wildlife refuges in conserving at-risk species has been posted on the Southeastern Partners in Plant Conservation website. Also available: videoed talks from the 2016 conference. Thirty-eight states were represented at the 2017 State Wildlife Action Plan National Meeting at Callaway Gardens Oct. 23-26. Nongame Conservation helped stage the Association of Fish & Wildlife Agencies-coordinated meeting focused on applying Wildlife Action Plans across state, agency and other boundaries. Georgia’s plan is a statewide strategy to conserve native wildlife and natural habitats before these species and places become more rare and costly to conserve or restore. 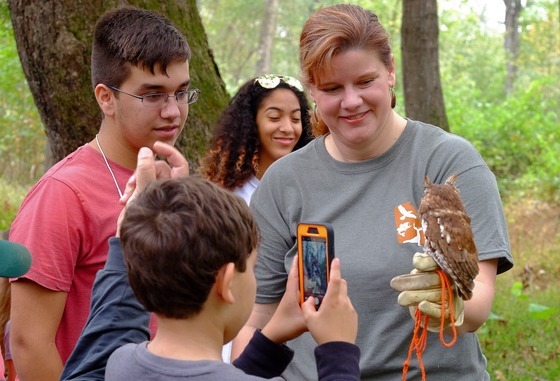 Revealing stats from this year’s Georgia Wild reader survey: 86 percent of respondents have told others or learned more about a wildlife species or issue in the newsletter; 23 percent were spurred to financially support conservation; and 66 percent didn't know until reading the enews that the Nongame Conservation Section is funded largely by grants, fundraisers and contributions. Five survey participants, hailing from Taylorsville to Macon, were drawn to receive a trunk organizer. 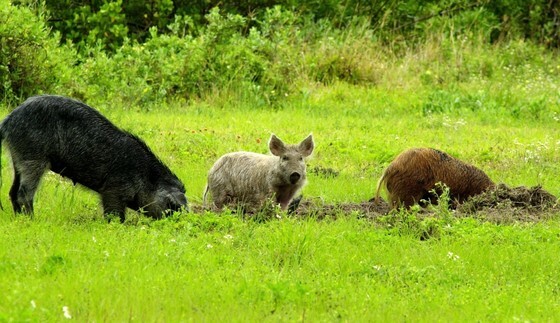 The latest salvo in the war on feral hogs features free workshops covering topics such as disease issues, regulations and control techniques, including trapping. The sessions starting this week and led by UGA, Georgia Farm Bureau, DNR and others are designed to help farmers and landowners stem the threat the invasive pigs pose to crops, wildlife and habitats. Schedule and registration (required). A manatee tagged by DNR and cooperators in June was found dead near Edgewater, Fla., Oct. 10. The adult male, which spent most of the summer near Sapelo Island and was part of a manatee tracking project ("On the trail of manatees," June 15), had been spotted with fresh propeller wounds last month and a necropsy documented infection as the cause of death. A $2,000 Gopher Tortoise Council grant awarded to DNR’s Dr. Jessica McGuire and John Jensen will be used with funding from The Environmental Resources Network to buy a 3-D gopher tortoise burrow display, complete with a mounted tortoise and other creatures that use the burrows. McGuire, Private Lands Program manager, and Jensen, a senior wildlife biologist with Nongame Conservation, envision the trailer-mounted display used for education and outreach at events such as the Claxton Rattlesnake and Wildlife Festival. Private landowners in Arkansas, Mississippi and Louisiana have protected 700,000 acres of critical wetlands in the last 25 years. That’s one-third of all wetlands under U.S. Department of Agriculture conservation easements in the nation, according to the agency’s Natural Resources Conservation Service. Names in the news: Nongame Conservation Environmental Outreach Coordinator Linda May presented a program on conserving native wildlife to about 60 volunteers at the Georgia Wildlife Federation’s recent Rivers Alive event. Volunteers removed invasive Chinese privet and litter from Mill Creek Nature Center, an 88-acre greenspace near the Mall of Georgia in Gwinnett County. In DNR Law Enforcement Division updates, Cpl. Brian Adams (Glascock County) has been named Game Warden of the Year. Capt. Bob Lynn (coastal region leader) has graduated from the National Conservation Law Enforcement Leadership Academy. Cpl. Jeff Billips (Burke County) has received the National Wild Turkey Federation Officer of the Year Award. And, Sgt. Doyte Chaffin (oversees game wardens in six east Georgia counties) has been selected the division’s Supervisor of the Year. 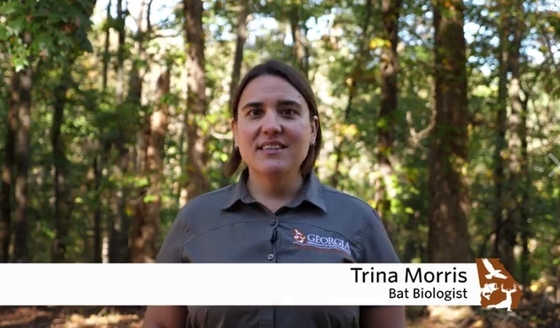 "Georgia celebrates 19,000-acre wildlife conservation area," WJCL-TV (Ch. 22, Savannah) and others via AP. Also: USDA. "Jenkins County fish hatchery gets new ecology mission," The Augusta Chronicle. Also: The George-Anne (Georgia Southern). “The starling and falcon dance,” Nick Dunlop. Also: “Hungry raptors make murmurations more beautiful to photograph,” Audubon.